Many of us remember what our high school lunches were like, and they are probably not fond memories. 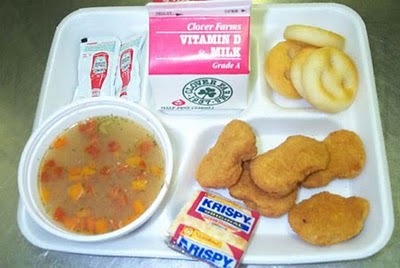 Many school lunches were rather lackluster and little more than a small sandwich, a carton of milk, and a sub-par side. With the recent budget proposal by Donald Trump that would cut funding to many food programs quite a few rely on, a drastic improvement to school lunch programs is needed. There needs to be a good balance between lunches that are healthy and lunches that have plenty of food. Often times, the food available to high school students is clearly not fresh; buns are stale, fruits have those tell-tale soft spots, and milk is expired. The portions are also often small, so even if the food itself has not gone bad, students are still hungry after they have finished their lunch. Many high schools are known to reuse leftover food for the sake of cutting costs, which leads to the bigger issue that schools face: lack of funding. It is not uncommon to hear about a high school having trouble with getting sufficient funding for all sections of the school. Since public schools receive their funding from the government, they often have to spend a specific amount of the funding on a specific department within their school. For example, the athletic department is often known for getting the lion’s share of the funding for a variety of reasons. Sports teams are a big crowd pleaser and they draw good publicity for the school and the school systems, ergo they receive more funding than most. While the athletic department of a school shouldn’t be underfunded, a portion of the excessive amount of money it receives could go to the school lunch program to help provide fresh food for the entire student body. Students deserve fresh fruit, fresh meat, and larger portions. This is a program that benefits all of the students, not just a specific subset of them. Thus, it deserves more funding, especially given that soon many students will be receiving less food thanks to federal budget cuts. The first question most study abroad candidates have is how to fund their overseas excursion. Most college students don’t have a bottomless pit of money to dig into when they want to pursue such grand and advantageous trips. However, thanks to the same technology that is making wealthy men out of making a potato salad, students are now raising money through crowdfunding. Crowdfunding has been a known to help many businesses, individuals, and charities over the year by allowing contributors from all over the world to give funds to worthy investments via Kickstarter, Indiegogo, GoFundMe and other hosting sites. This in turn can be taken advantage of in many ways, which RU students have been discovering as they search for ways to enhance their college experience. There are, of course, both advantages and risks to such an innovative way to raising money. The benefits include the customization of a personal profile for the candidate, much like a more intimate application. Feedback, however, is more immediate than a scholarship application. Risks involve the reputation of the user — such a public display does mean that everyone has access to your progress. And of course, there is always the risk of failure due to the public fear of abuse for such modes of fundraising. However, with a smaller goal and the marketing vehicle of friends and family, this shouldn’t be too much of a problem for students. Those of you who have been in search of just such a replacement or supplement to financial aid, scholarships, and loans can now look at websites specifically created to host such campaigns, like Fund My Travel. Already these attempts have had some success, such as RU’s own Jodie McKaughan who used crowdfunding to finance two study abroad internships this past summer. With the use of global technology, it only makes sense that students should take advantage of the global advantages.